Any web developer can tell you that the language of computers is very different from what we use in everyday life. For instance, while you may be able to get away with a few stray punctuation marks here and there in English, all it takes is one errant bracket to completely change the meaning of a code. That’s why typeface creator Hoefler & Co. has released a new kind of font specifically designed to make programmers’ jobs easier. 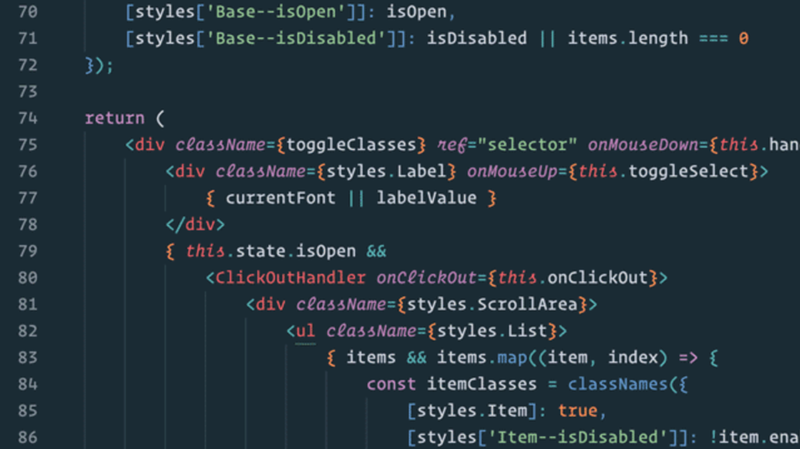 "Operator" achieves this goal by using smart color-coding and italics for characters that require extra attention while coding. For developers writing in this font, distinguishing between the characters l, I, and 1, or colons and semi-colons, for example, is made easier, thus reducing the chance for error. The font comes in two varieties—the natural-width "Operator" typeface and the fixed-width "Operator Mono"—and nine different weights. Programmers looking to up their coding game can purchase the font starting at $200 from Hoefler & Co.
Natural width operator family via Hoefler & Co.